Posted byDave Coustan	 August 22, 2008 4 Comments on Mouthwash Fund? General Tip Jar? 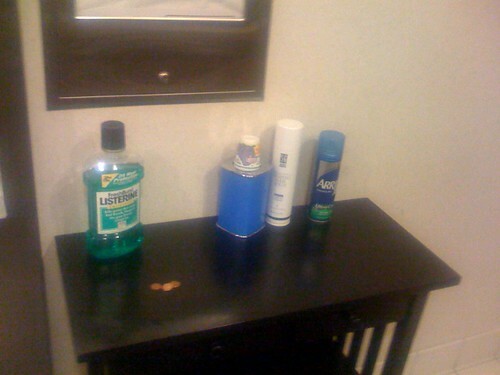 What’s up with the three pennies by the table in the men’s bathroom? Any theories? I think it’s someone who hate pennies, who – until the government does away with them – leaves pennies in various places around town as works of art. The penny appears to be arranged in the shape of an arrow, possibly pointing to a dead body in a locked stall. Or to a stall which is low on toilet paper. It restaurant code, three pennies as part of the tip tell the waiter that the service was terrible.